I saw The Simpsons Movie today and found it quite enjoyable. Meanwhile, you may have heard that 7-11 had converted 12 of their stores into Kwik-E-Marts to coincide with the movie’s release. One of them is just down the street from my parents’ house in Dallas, and we stopped by on the way to the airport. I’ve posted a few photos here. This entry was posted in Movies, Photos on July 30, 2007 by Arcane Gazebo. I need to go see the movie… but I should see the rerelease of Labyrinth first. I think I’ll end up going to that one on my own, but that’s a small price to pay to catch a movie I want to see. Now here’s the tricky part! Oh, won’t you rhyme with me? I wanna’ play Mario Kart! 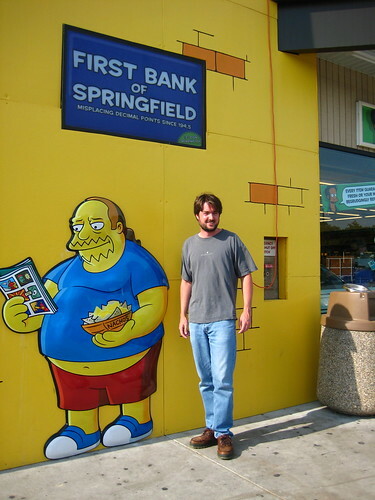 The Quik-E-Mart is real… D’oh! I can’t believe I misspelled Kwik-E-Mart consistently three times. Must have been a long day.